Seven Wonders: Book 3: The Tomb of Shadows, by Peter Lerangis will appeal to tweens and teens who like lots of action and danger in their stories and who are curious about ancient history. Welcome to the 7th stop of The 39 Clues blog tour. We are thrilled to host Peter Lerangis! Be sure to enter the giveaway for your chance to win books 1-7 of this exciting and groundbreaking series. The teacher looked distressed as she greeted me. “I can’t believe what happened to my class,” she said. I braced myself. Behind her, hundreds of excited kids were filing in to the gym. They sat in sections based on the colors of their shirts: red, blue, green, gold, representing the four branches of the Cahill family. Most were dressed as 39 Clues characters. Jonah Wizard (with his bling) and Nellie Gomez (with her punk attire) were very popular — but also a set of twins dressed as fish (Saladin’s red snapper), a girl in a three-piece suit (Jonah’s dad), and a guy dressed as Nellie. 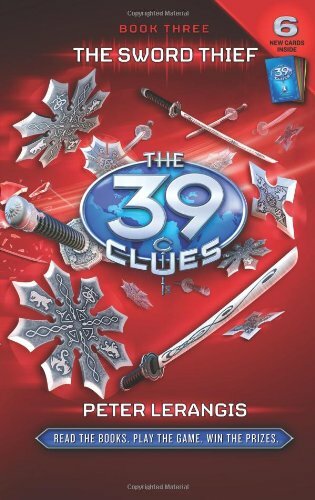 NEW YORK, NY (February 2, 2010) – The global hunt for The 39 Clues®, the New York Times bestselling multi-media adventure series that combines books, collectible cards and an online game, continues with the release of “Book 7: The Viper’s Nest” by Peter Lerangis, in stores today. With the publication of this new installment, one of the key mysteries in the series—which branch of the Cahill family Amy and Dan belong to—will finally be revealed. Also today, Scholastic releases “The 39 Clues Card Pack 3: The Rise of the Madrigals,” a new wave of randomly assorted collectible game cards, to span Books 7 and 8, plus the simultaneous audiobook edition of “The Viper’s Nest” which includes exclusive bonus material. With the release of “The Viper’s Nest” and “Card Pack 3: The Rise of the Madrigals,” six new Clues will be revealed, bringing a total of 28 Clues unveiled to date.